An RV can be a fickle beast. Just when you start getting to know it and warming up to it, feeling that you’re becoming well-acquainted and comfortable with each other, it can turn on you in the blink of an eye. A leak develops in the roof and drips into the master bedroom. A faucet starts leaking profusely and needs replacing…now. I know, this is normalish stuff. It is to be expected to some degree. But when it just comes out of nowhere, and especially all at the same time, it’s easy to feel betrayed by your new adventure buddy. All of the issues above have reared their ugly heads at us in the past year on the road. We have addressed them all with minimal consequences (as far as I know), but also with a bit too much drama and moaning (sorry family). We have seen more cases of RV awning destruction around us in the past year than anything else I can think of. Luckily, ours is still in one piece and in good condition. But it really is due to dumb luck more than my own proper care and maintenance. The cost of an RV awning replacement is enough to bring on instant nausea. It would obviously be different in each case, but staying under $1,500 -$2,000 for complete replacement would be impossible on most RVs. 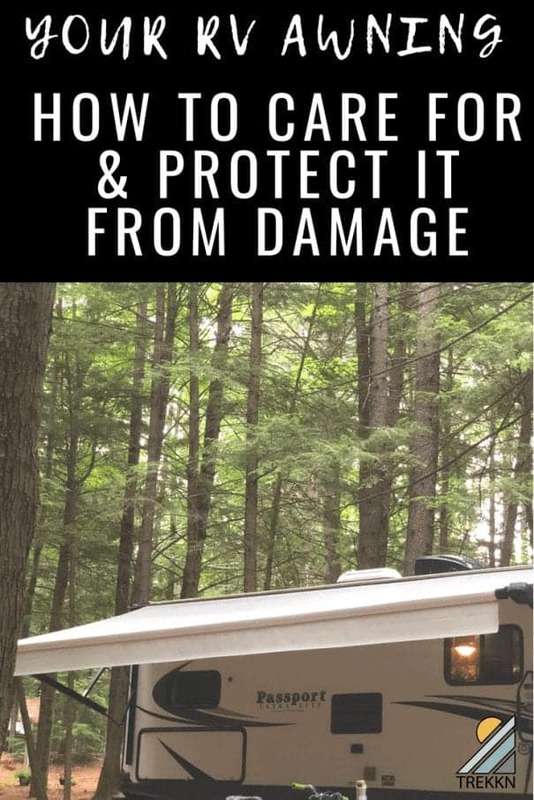 If you are new to the world of RVing, I would like to save you from this painful potential reality by sharing four tips to properly protect and care for your RV awning during your outdoor adventures. Now, this tip is a bit tricky and I think there are (possible) exceptions to it. But it all boils down to this: Your awning is most likely to be destroyed by either (a) wind or (b) rain. These are the enemies. Maybe that’s already pretty obvious to you, and maybe not. When we were newbies, we had not caught on to this “obvious” point and it took a friendly neighbor pointing out the dangers of our actions to get us in line. The fact is that when your awning is extended, especially to its full capacity, it acts like a sail on a boat and can catch relatively light breezes very effectively. But its orientation parallel to the ground means that that light breeze can start a violent “wave” action very easily which will tear the awning away from the RV. The awning can simply be shredded to pieces in a matter of minutes if a breeze kicks up unexpectedly. And there’s a similar danger with the rain. When the rain starts pooling on your awning, it doesn’t take much at all for the weight to add up and become more than the awning can support. Depending on the condition of the awning material, this could result in either a giant tear in the awning or, again, separation from the RV. In either of these cases, the support arms for the awning can also be twisted and severely damaged. This potentially requires replacement of the entire awning mechanism and not just the RV awning fabric. A deadly double whammy. Now, there have been times where we have become familiar with an RV park and know that it is well protected from gusts of wind (tucked into the trees, etc.). If the weather forecast looks clear, we will sometimes leave the awning out under these circumstances. I am not recommending this practice but just letting you know how we have handled things in our situation. Sometimes, I’m a little slow at checking things out and finding solutions to simple problems. I admit it. 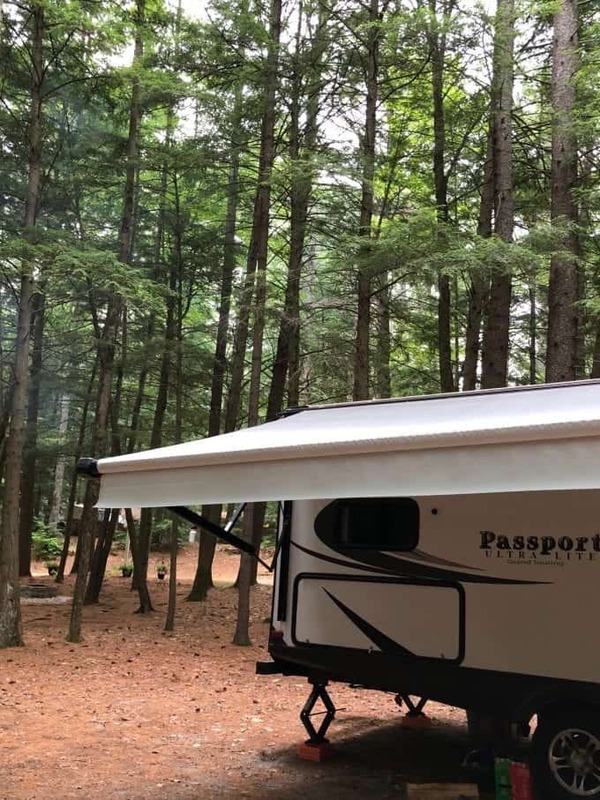 When we moved into our RV in May 2017, I knew from the stickers on the RV awning arms that the pitch of the awning was supposed to be easily adjustable “with one hand”. For some reason, it wasn’t adjusting easily for me and I was afraid of damaging the awning by pulling too hard. So I just left it as it was. Ironically, that almost cost me an awning. During a rain storm one day, I started hearing the awning kind of creaking a little bit from inside the RV. I was immediately concerned and jumped outside to check things out…and saw that the awning fabric was sagging a bit in the middle. Quite a bit. I quickly realized that the rain was pooling in the awning and I had to act fast. I ran over to the support arm by our door and pulled down at the pivot point indicated by the stickers. The pitch of the awning immediately adjusted and a flood of rain began pouring off the awning and onto the ground a few feet from me. I ran to the other support arm and did the same thing and more rain gushed to the ground. The sag disappeared. Don’t let yourself be the victim of this same issue, my friend. Use the pitch feature wisely to help avoid your own RV awning replacement. I’ve seen one too many horror stories about this type of scenario playing out. Luckily, I have not had a close call with this potential danger. I get it. I would have thought the same thing a year or so ago. But I’ve been caught up in the “controlled chaos” of a rushed move enough times to realize that it is a realistic threat to us RVers. 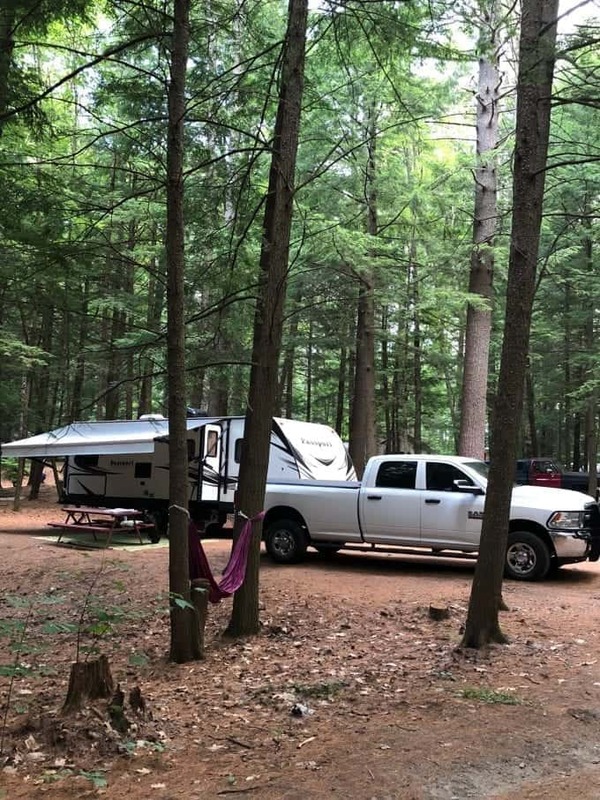 Here’s a scenario for you: You’ve just finished with a long day of driving your RV down narrow and winding roads out in the middle of nowhere. You’re already exhausted, eyes and nerves strained to the max, when you arrive at your RV park for a much needed rest. You back yourself into a spot and it seems to be perfectly level, so you go ahead and put your slide and awning out and drop your stabilizer jacks to settle in to your new home. But when you get into the RV, you realize that the bubble on your level must have been acting up a bit and you are actually not level at all. 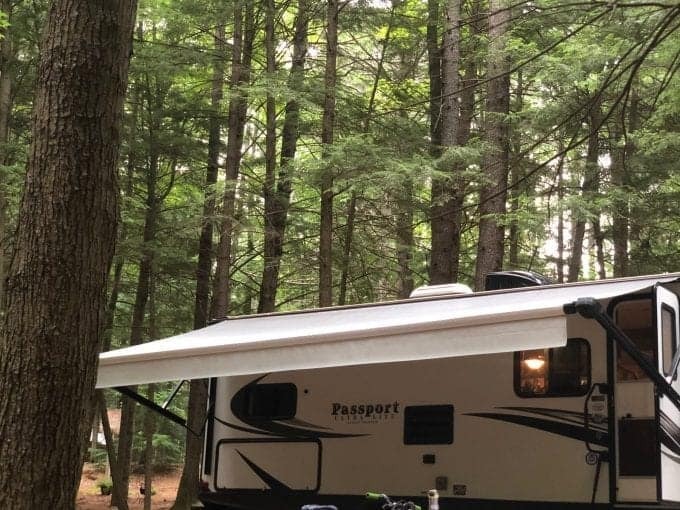 You need to get out those handy Andersen Levelers we discussed in this RV accessory article and move your rig on top of them to get things perfectly leveled. Oh how I love this sinking feeling. So in your frustration and exhaustion, you jump back outside to get this task accomplished as quickly as possible so you can kick back and relax. Stabilizer jacks up: check. Slide in: check. Hitch coupler locked: check. Now, roll forward 2 feet to position the rig on top of the levelers: DISASTER! In your rush, the awning was left out a few feet and you crunched it right into the one tree on the site that was a bit too close. Don’t let yourself get caught in this situation. Slow down and take an extra 30 seconds to do a quick walk-around of your RV before you move it even a little bit. Your bank account (and remaining sanity) will thank you. I may have been lucky enough to avoid all of the disaster scenarios I’ve covered so far, but this particular tip comes straight from my own inconvenient experience. We have had numerous occasions where the RV awning was out the night before a move to another park and we received some rain during the night. In these instances, that awning does often save you some mess and hassle by keeping all of your stuff dry under its cover. That always makes move day a bit easier. But when you’re packing up pretty early in the morning before that awning has had a chance to dry out at all, you are potentially creating a hidden mess that will definitely not make your life any easier. If you happen to be in a tight RV site at the RV park you are relocating to, that wet awning could stay rolled up for several days, or weeks. When this happens, mildew on your RV awning will be the inevitable result. Believe me, I know. Dealing with the mildew down the road can truly be a headache. And the longer it is left untreated, the worse your situation will be. If you catch the mildew pretty quickly, it can be pretty simple to clean it off with a mildew removal product like this and not have any signs of its presence. But the longer it sits, the more chance there is that it will permanently stain your RV awning fabric and leave it looking pretty worn and nasty. Nobody wants that, especially when the time comes to sell that RV. So do yourself a favor and get that RV awning dried out completely just as soon as you possibly can after the rain. It will absolutely mean less hassle and less money out of your pocket in the end. 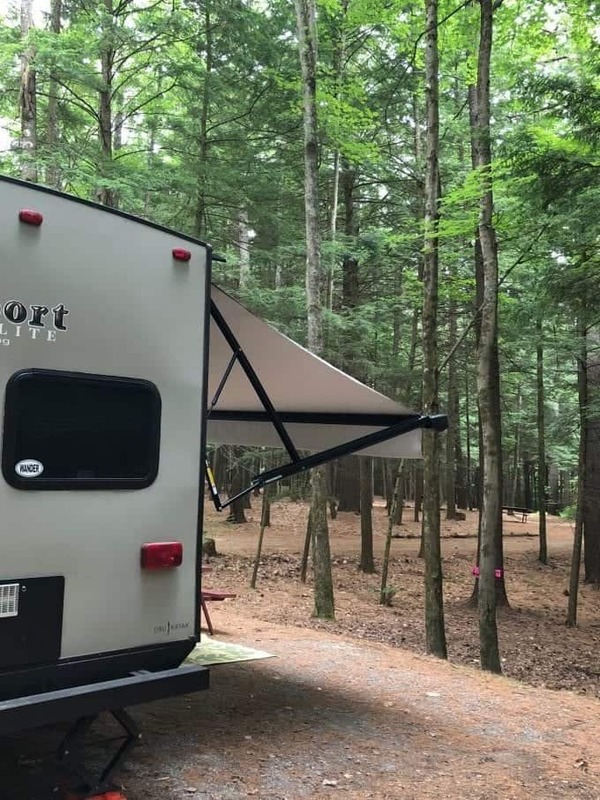 When you’ve got a slide or two, an AC unit or two, a refrigerator and a dozen other expensive components on your RV, it can be easy to neglect the RV awning. 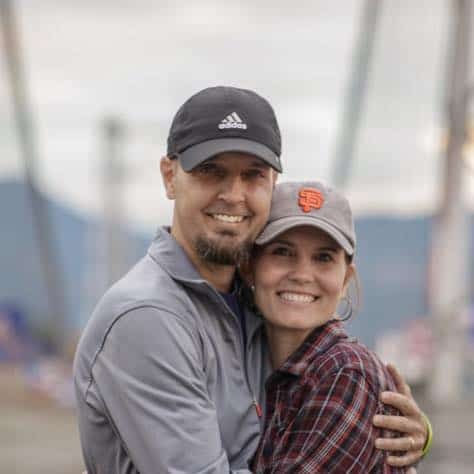 But I hope this list of our top tips for avoiding RV awning replacement has helped you realize that your awning really does deserve just as much consideration when it comes to properly caring for your RV. In the end, we all want a good-looking, fully operational RV that will meet our needs for years and fetch a good price when the time comes to sell.